I've had this stamp for a while now and I've been wanting to make something with it. Even though I still haven't cleaned my room all the way I made this quickie card in the tiny space I had. Tomorrow I am planning to make a very late birthday present for my friend Krista (sorry Krista!) so hopefully I can post that soon. Anyway this card-I got the sketch from an old project sheet. Border Punch: Martha Stewart-I just got this punch last week and I LOVE it! It's so cute! Great card! The ballerina stamp is so cute! I really like that border punch too! This post could not have come at a better time! I was just looking at my ribbon thinking what I could use my floral prints on! BINGO! Love the card! this stamp is precious and I love the colors... so fresh and pretty! Great job Gale!!! That image is so cute! I love the border punch you used, don't think I have seen it before. That is adorable, and I love that cute ribbon! This is just too cute, Gale! 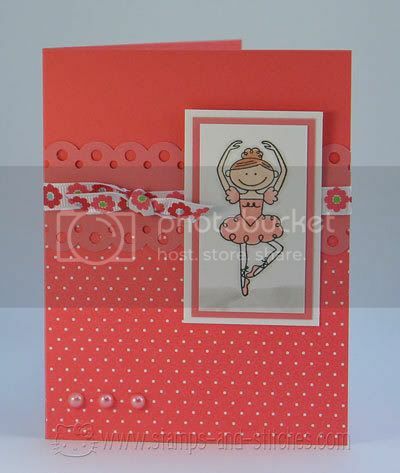 I love the polka dots with the ballerina! This is so, so cute Gale! I love the image and the colors. I had this punch in my hands at the store yesterday and almost purchased it. I wish I did! Cute Cute is right...It's just a perfect layout and congrads on the new punch its wonderful looking!!!! So cute! Lovely colors and what a cute ribbon! What a cute card! That stamp is adorable and I love the ribbon and pearls. Perfect for a little girl! I am lovin that border punch!! It is seriously tooo cute! (its on my must have list!!) I LOVe these colors and the little pearl embellishment is just perfect!!! A totally and complete beautiful card! Awesome LO!!! I am mentally filing it away for later use (my mental filing is useless though!). The colors are bright, and I love that you used mostly just the orange. That border punch is great! My girls would love that stamp! Oh, and those sheets were Inspiration Sheets, I think, and it's a shame they quit that, I still have a binder of them, they ROCK!